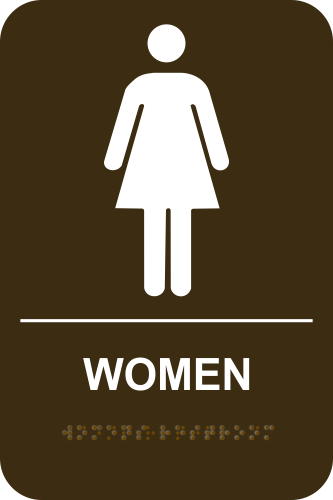 Braille dots that are molded into the sign make for a durable Women's Restroom sign. This 6"x 9" sign helps visitors locate the bathroom. Gender Neutral with Icons - ADA Compliant 10" x 10"
When women need to locate a restroom they count on a sign like this. Provide simple clarification with an image, text and braille dots. 6" wide x 9" tall with brown material yet showing the Women's Restroom wording and symbols in white; this simple stock sign is easily visible and meets all ADA requirements.